Facebook has announced a major addition to its social network - a smart search engine it has called graph search. The feature allows users to make "natural" searches of content shared by their friends. Search terms could include phrases such as "friends who like Star Wars and Harry Potter". Founder and chief executive Mark Zuckerberg insisted it was not a web search, and therefore not a direct challenge to Google. However, it was integrating Microsoft's Bing search engine for situations when graph search itself could not find answers. 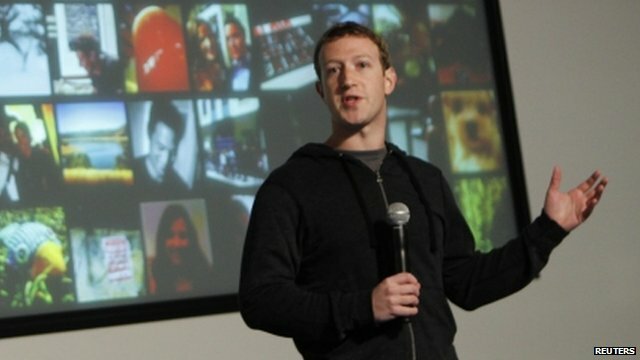 Mr Zuckerberg said he "did not expect" people to start flocking to Facebook to do web search. "That isn't the intent," he said. "But in the event you can't find what you're looking for, it's really nice to have this." Earlier speculation had suggested that the world's biggest social network was about to make a long-anticipated foray into Google's search territory. "We're not indexing the web," explained Mr Zuckerberg at an event at Facebook's headquarters in California. "We're indexing our map of the graph - the graph is really big and its constantly changing." In Facebook's terms, the social graph is the name given to the collective pool of information shared between friends that are connected via the site. It includes things such as photos, status updates, location data as well as the things they have "liked". Until now, Facebook's search had been highly criticised for being limited and ineffective. The company's revamped search was demonstrated to be significantly more powerful. In one demo, Facebook developer Tom Stocky showed a search for queries such as "friends of friends who are single in San Francisco". The same technology could be used for recruitment, he suggested, using graph search to find people who fit criteria for certain jobs - as well as mutual connections. Such queries are a key function of LinkedIn, the current dominant network for establishing professional connections. "We look at Facebook as a big social database," said Mr Zuckerberg, adding that social search was Facebook's "third pillar" and stood beside the news feed and timeline as the foundational elements of the social network. Perhaps mindful of privacy concerns highlighted by recent misfires on policies for its other services such as Instagram, Facebook stressed that it had put limits on the search system. "On graph search, you can only see content that people have shared with you," developer Lars Rasmussen, who was previously the co-founder of Google Maps, told reporters. Mark Little, principal analyst at research firm Ovum, said he was "underwhelmed" by the announcement. "I think probably people were looking for something a little bit more strategic," he said, adding that graph search might well be a bridge to a more comprehensive search offering in the future. "On the plus side I think it's going to help drive connections within the network between individuals and between companies and pages," he said. "If you are increasing connections between friends and pages you are effectively increasing the reach of advertisers." In his demonstration, Mr Stocky showed how graph search could help any attempt to go back over old content that a user may want removed. For instance, it could let someone use search queries - such as pictures taken at a certain location, such as a night club - and untag them en masse. Mr Zuckerberg said that graph search would launch immediately as a beta test, and would roll out "very slowly". The tool will be usable from the blue banner that sits at the top of every Facebook page. "We're going to put an encouragement on the home screen of everyone's account so that everyone has the chance to look through these tools. "We're going to do this before graph search is fully rolled out." He added that external developers would eventually have access to the data in graph search - but access wasn't available yet. "There's a very long list of things that we didn't do for version one. We have years and years of work ahead of us."